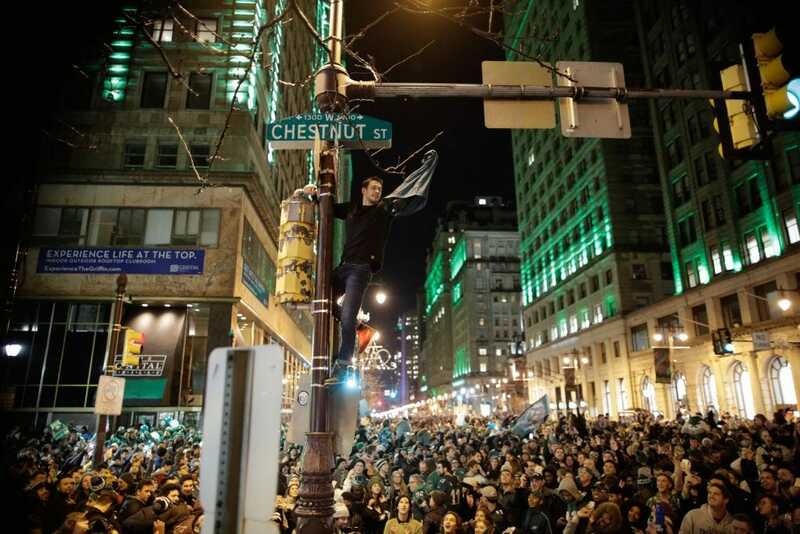 Getty ImagesA man climbs a traffic pole as Philadelphia Eagles fans celebrate victory in Super Bowl LII against the New England Patriots on February 4, 2018 in Philadelphia, Pennsylvania. After the Philadelphia Eagles won this year’s Super Bowl, fans went ballistic. They gathered near City Hall to celebrate the win, the team’s first in franchise history. A local ad agency, Brownstein Group, captured the hoopla in the timelapse below. The video begins around 10 p.m. on Sunday night, with cars passing like normal – until the end of the game. Anticipating the incoming mass of fans, a police squad on bikes promptly showed up on Broad Street, one of Philadelphia’s main thoroughfares. Crowds flipped over a car, set another vehicle on fire,scaled the gates of City Hall with a keg, took down and climbed streetlights, smashed windows, and littered streets with debris. The Philadelphia Inquirer also reported that several fans looted a gas station. Three arrests were made during the night’s celebrations, the Mayor’s Office said. The timelapse ends late into the night, when the crowd finally disperses. On Monday morning, city crews started cleaning up, a job that consisted of sweeping up broken glass, picking up beer cans, and repairing traffic poles. 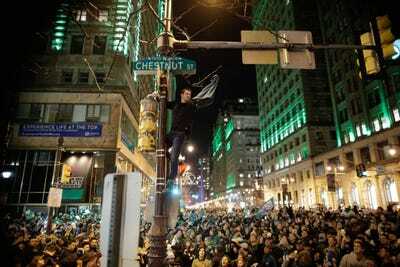 By noon, workers began preparing for Thursday’s Super Bowl victory parade, according to the Inquirer. The city expects two million people to attend the parade, which could generate over 50 tons of trash.